Kathryn Breaker is a master collaborator and change catalyst with an expertise in driving the vision to deliver on community and organizational goals. She is a dual citizen having grown up in Texas and graduating from the University of Arkansas with an MBA in International Business. 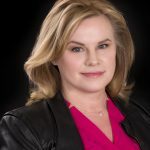 After moving to Calgary, Kathryn earned her Certified Managerial Accountant (CMA) designation and founded Kathryn Breaker Professional Corporation, a financial management and planning consulting firm. With a blended background and demonstrated success serving as an advocate and champion, Kathryn’s focus is on raising awareness to support meaningful initiatives. She is committed to public service and advancing the organizational mission to advance human ingenuity and talents to help solve the tough global challenges we face today.